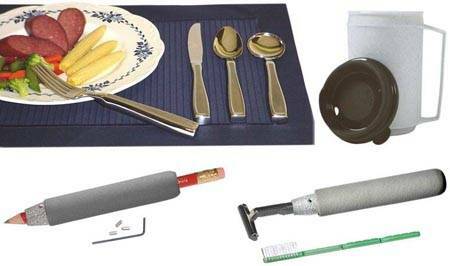 The Weighted, Insulated Cup set are great additions to our weighted line of eating and dining aids. 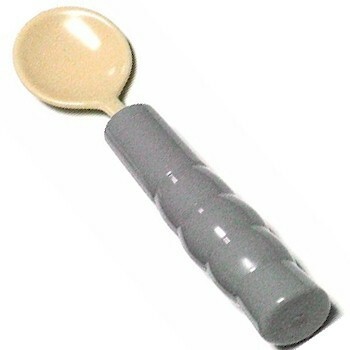 In addition to the insulation to keep foods and drinks either cold or warm, these bowls and cups have a steel weight added internally to the base to lessen the intensity of tremors of the hand commonly associated with persons having Parkinson's Disease and other illnesses or injuries that cause tremors. The cup comes with a "no spill" lid in white. 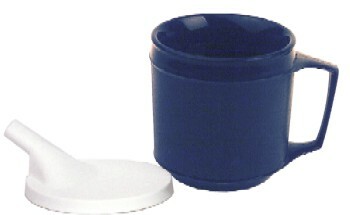 The cup and bow are constructed of a durable, blue plastic. The cup and bowl cannot be used in the microwave due to the steel weight. The cup holds 8 ounces of liquid and weighs 8 ounces. The bowl holds 12 ounces and weighs 1 lb 2 ounces. It is recommended that the cup and bowl be washed in the top shelf of the dishwasher only. Remember: weighted with steel; do not microwave.